I am a new mom of twin girls. During my pregnancy I became interested in finding someone who offered belly binding along with abdominal work to help with the healing process after birth. I had been casually searching for someone who offered both services when I went into labor with my girls, who were born a little sooner than expected. While in the hospital I began to seriously search for belly binding services and found Sarah’s business page. After reading her bio I decided to get into contact with her to try to schedule services. She responded quickly and was able to schedule an appointment for me the same week, she also worked with my hectic schedule to make sure I could get in to see her, I actually had to drive over an hour to see her in her office and hit traffic along the way, but she stayed late to make sure I could get my session in. I ended up getting the Hot Stone Abdominal Press with a Warming Belly Oil application followed by the belly bind. I also took home some herbal tea based off of my conversation with Sarah around how I was feeling and the things I experienced with my previous postpartum experience. I chose Sarah because she was one of the only providers I could find that offered all services I was looking for. When I walked in to her office I was greeted with a smile and a hug. 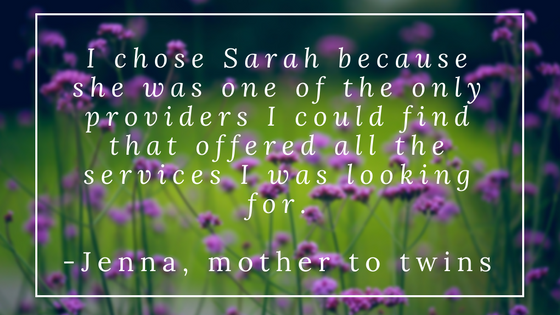 She thoroughly explained everything the service entailed and she truly listened to everything that I wished to accomplish at this stage in my postpartum recovery. I would highly recommend Sarah to anyone seeking natural postpartum care. P.S. The bind has been awesome, I’m starting to notice a difference already. Also enjoying the tea!